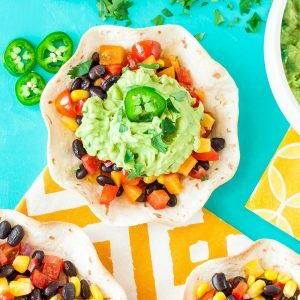 Get your guac fix with these tasty vegan Guacamole Tacos with Southwestern Veggie Salsa! If using store-bought crunchy tortillas, crisp in the oven or toaster oven per package instructions and set aside. To make your own, see post below for instructions. Chop your veggies for the salsa and combine in a bowl with oil and vinegar. Season with salt and pepper to taste and toss to coat. In a separate bowl, mash avocados to desired consistency with a fork and season with cilantro, garlic powder, cumin, and salt. Stir in your red onion and any optional extras [diced tomato or jalapeño are super popular] and your'e good to go! Pile each tortilla high with your salsa and top with a small tower of guacamole. Garnish with cilantro and jalapeño slices and dig in! Nutrition Facts below are estimated using an online recipe nutrition calculator. Adjust as needed based on extras added and enjoy!